Jon: “Poladroid” is the best waste of time (and computer memory) ever! Luckily, a new computer application called Poladroid has popped up allowing users to create startlingly real looking polaroids from there digital photos. Normally, I wouldn’t download something like this, but I decided to give it a shot. It was totally worth it. The program functions exactly like a real polaroid camera, forcing you to wait a minute or two for your picture to “develope”. Anyway, go waste some time and download Poladroid now! 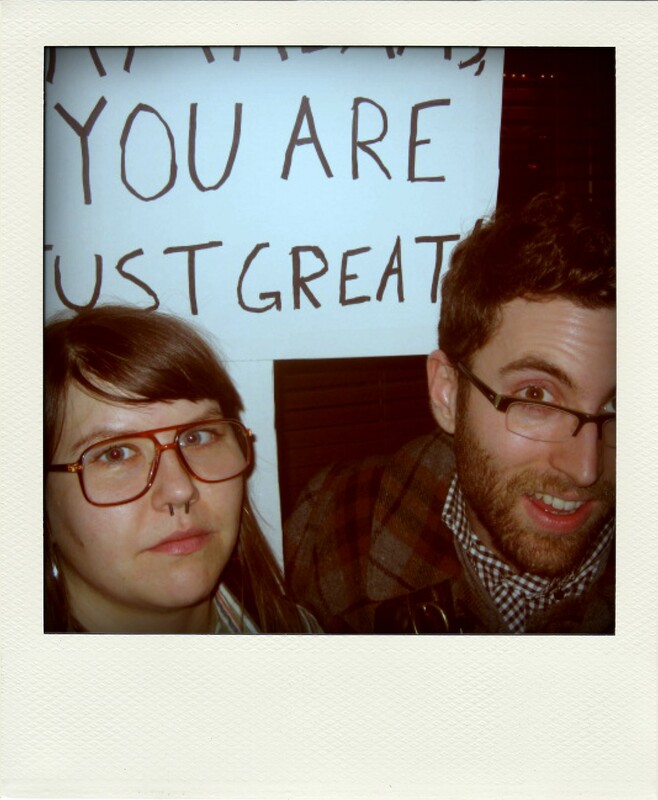 Here is a polaroid I made of myself and Nickey from the Sam Adams rally. And yes, that is the beard…almost. I’m sure many of you have seen Los Angeles based street artist, Shepard Fairey’s work in a variety of mediums… The artist made his work known to the general public in a Che Guevara-esque portrait of Obama which has since been printed on tee shirts, stickers and posters and had been used to raise money for the Obama campaign. Fairey’s work was based on an image he found on Google which was originally printed in the Associated Press. Such high monetary demand made the Associated Press bring out their fancy suit lawyers stating Fairey didn’t license the image and that they deserve a cut of the profits. This is just another greedy control game played by corporations that are holding on to the very thin strands of corporate enterprise vs artistic expression. Clearly, the photo was “inspired” by someone/thing the artist looked at – as most portraits are…. What’s next? A farmer suing a painter for making a painting of his barn? If you ask me, I think the graphic representation of Obama holds a different expression…. more optimistic and approachable than the photograph. …I find the second video oddly calming.